Locality: United States, Colorado, La Plata, Teelewauket Ranch above Vallecito Dam. Habitat: Shaded mountain stream and shaded bank. 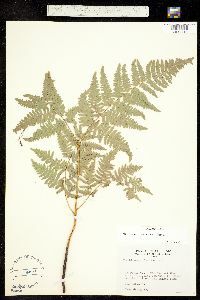 Notes: Pteridium aquilinum (L.) Kuhn ssp lanuginosum (Bong.) Hultén, det. by W.A. Weber, no date.